When the iPhone XR originally went on sale on Apple’s website, you had to choose a carrier: AT&T, Sprint, T-Mobile, or Verizon. But now, if you buy an iPhone XR online, you now have the option to buy one without a carrier. We’re not sure when this option became available; we noticed today. 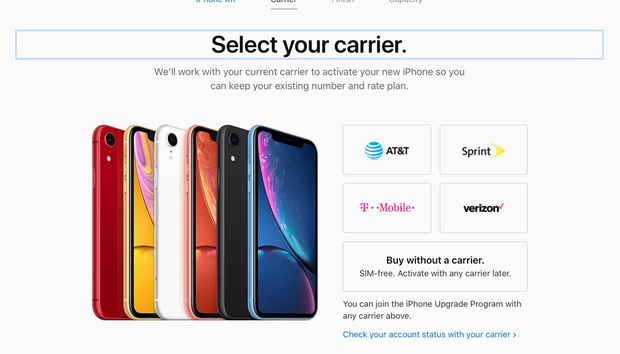 The Internet Archive’s last snapshot of the iPhone XR buy page is from November 8, which does not show the option to buy the phone sans carrier. Pre-sales for the iPhone XR started on October 19, and you had to pick one of the four carriers for the phone. When the iPhone XR started shipping a week later, you still had to choose a carrier. Earlier this week analyst Ming-Chi Kuo, known for being pretty accurate with his forecasts, cut his shipments estimates for the iPhone XR. Could this new option help iPhone XR sales? It can’t hurt, but his estimates were cut by millions of units. The “without a carrier” option probably won’t increase sales in that big of a way.